A new dining option is coming to the Downtown Mall area. Partners J.F. Legault and Francois Bladt plan to open Glass Haus Kitchen as soon as next week, in the space formerly occupied by the X Lounge, 313 2nd St SE. At the helm of the kitchen is head chef Ian Boden, who recently sat down with us to discuss the new venture. Boden, one of the area’s most talented young chefs, is best known for his restaurant Staunton Grocery, which closed last year. 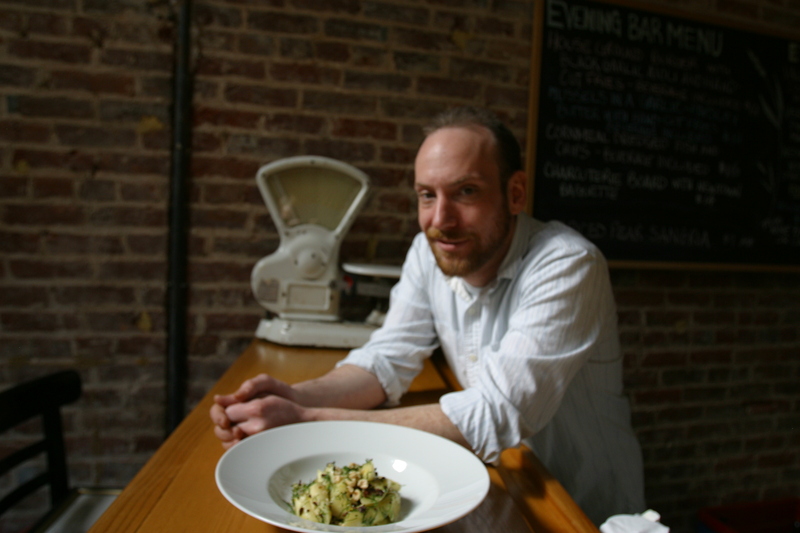 Boden’s mission at Staunton Grocery was to create a “farm to fork restaurant in the Shenandoah Valley that was chef driven, locally sourced and with none of the trappings of a traditional fine dining restaurant.” At that, Boden succeeded. For five years, Staunton Grocery was a destination for food-lovers throughout Virginia. Before Staunton Grocery, Boden honed his skills both through formal education at the New England Culinary Institute as well ten years of on-the-job training in the kitchens of several of Manhattan’s top restaurants. These include Judson Grill (now closed), Payard, and Home. A Virginia native, Boden’s move to Staunton was a homecoming of sorts. And, now Boden is excited to bring his passion and philosophy to Charlottesville, at Glass Haus Kitchen. We were lucky to try an example: an ethereal goat’s milk panna cotta, which Boden plans to top with pickled Stingray oysters, sea beans, finger lime, and togerashi. Appetizers will range from $12-$16, and will include a dish of pork belly, potlikker gastric, and savoy cabbage. Entrees ($24-$34) include duck confit with laurel-aged rice, duck hearts, bok choy, and cranberry dashi. Among the dessert options are a tart of pine nuts and buckwheat, with Greek yogurt and bay laurel. There will also be a bar menu with choices ranging from $5-$14. Joining Boden in the kitchen will be Mike Yager, who spent five years at Palladio restaurant at Barboursville Vineyards, most recently as executive sous chef.